July | 2010 | The Jamestown Comet. Sometimes those we don’t see make a bigger impression on us than we realize. Thus is the case with film stunt legend and whip artist Alex Green. The Brothers & Co. Entertainers of Jamestown will headline two performances at the 2010 Annie Oakley Days Festival in Greenville July 24. Some of the world’s best Wild West artists will be performing at this year’s Annie Oakley festival including two veterans of NBC’s America’s Got Talent. Jamestown couple still struggling two years after Wilmington DHL closing. 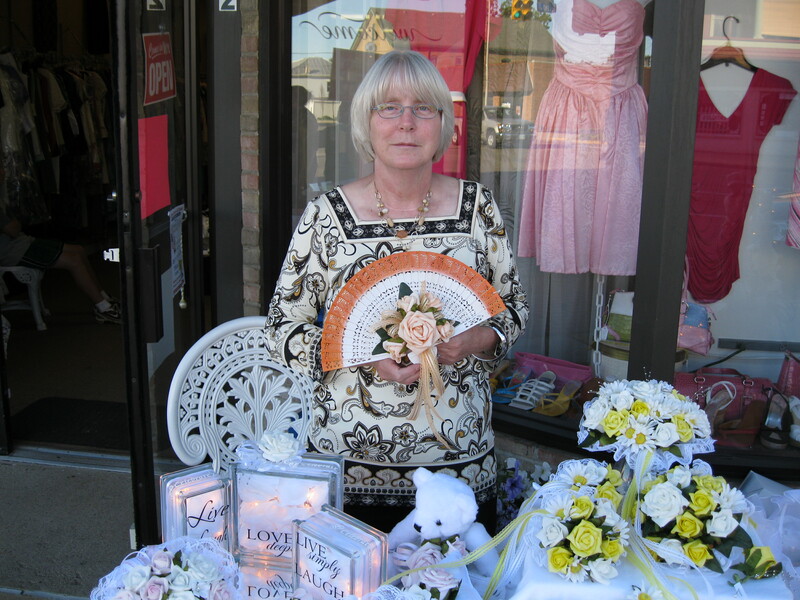 Cathy Wolf shows off her silk flower packages in a home-made display on July 2nd during Xenia’s “First Friday” event. far beyond the borders of Clinton County. Like the rest of the nation, Ohio’s unemployment rate continues to climb with no relief on the immediate horizon. Nearly two years after the closing of the DHL facility, many of the company’s former employees and their families are still struggling to find a new way to make a living. Dire enough for younger workers, the situation is even more desperate for those more seasoned employees who were displaced after many years of service. Some of the most experienced and valuable of the population is having the hardest time returning to work. Cathy Wolf is about to celebrate her 55th birthday. She lived and worked in Wilmington with her 48-year-old husband Robert, until he became one of more than 7,000 employees discharged from DHL. After nearly two decades with the company, the hope of a secure retirement evaporated in an instant. Shortly after, Cathy also lost her job with a vending supplier that serviced the air park and surrounding area. It was fortunate that the Wolf’s three children were already grown and on their own, especially considering that the couple was forced to give up their Wilmington home to the mortgage company and file for bankruptcy. Their credit destroyed and living off of a cashed out retirement account, they managed to find a small house to rent in Jamestown and set to the arduous task of searching for new jobs. To complicate matters, Cathy and Robert have been doing what they can to help ailing parents and support their middle daughter who is raising a new baby after losing her husband to kidney disease in the summer of 2009. Now, almost twenty-four months after the layoffs, benefits are exhausted and, thanks to state cuts in job training and educational resources, Cathy and Robert have been left with few options. With rent to pay and food to buy, Cathy decided to take matters into her own hands. A 1974 graduate of the Greene County Career Center, then known as Greene Joint Vocational School, Cathy’s educational background was in horticulture. Over the years, she worked in nurseries, green houses and similar jobs though her skill and enjoyment was always in floral arrangement. Rather than lose to a lethargic economy and empty promises from the bureaucrats in Washington, Cathy chose to go into business for herself designing and selling pre-packaged silk flower arrangements for weddings. Cathy has branded her fledgling business, Cash, Carry & Get Married, marketing to smaller weddings on a limited budget. Not to be left out, Robert has also been working to get a handyman service off the ground. A skilled maintenance worker and experienced forklift operator, Robert has taken to doing residential repair work passed along by acquaintances from their church. Cathy and Robert should have been looking forward to retirement in another 15 years but instead they are starting over. Armed with basic tools and supplies and a handful of home-printed business cards, the couple is determined to do for themselves that which Washington and Columbus have failed to achieve. As prospects for employment diminish for those older workers affected by today’s challenges it will take fortitude, faith and a little luck to make it in an economy that has all but turned its back on the elder population.